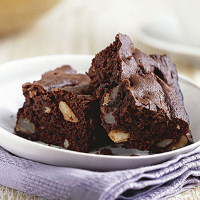 Nuts and fresh fruit add texture and flavour to our indulgent version of the classic brownie. Preheat the oven to 180°C, gas mark 4. Line a 30cm x 20cm x 4cm rectangular tin with baking parchment. Put the butter and chocolate in a small pan and place over a very low heat until melted, stirring occasionally. Now, in a large bowl, beat the sugar and eggs together until pale and fluffy, using an electric whisk for speed. Gradually pour in the melted chocolate mixture and continue whisking until combined. Using a metal spoon, fold in the flour and cocoa then stir in the pears and nuts. Pour the mixture into the prepared tin and bake for 30-35 minutes, until the brownies are just set (see Cook's tip). Remove from the oven and allow to cool in the tin. Cut into 20 squares before serving. Do not overcook the brownies or they will become dry rather than moist and fudgy. The brownies can be stored in an airtight container for 3-4 days.